As we are all aware my Stampin Up demo kit arrived today. I got home, Jeff and I were going through the box of goodies. He was taking the stuff out of the box and handing it to me. He looks over at me with this strange look and says "and you got this makeupkit". I give him the same strange look back and say "huh, a what". He repeats what he says and he hands me the Stampin Up Pastels. It was funny but so sweet and innocent. Just to let you know I wear no makeup at all because I have extremely sensitive skin. He gave me a good laugh! I can see though where he would have thought it was a makeup kit. Oh I never noticed......but it sure does look like a make-up kit!! 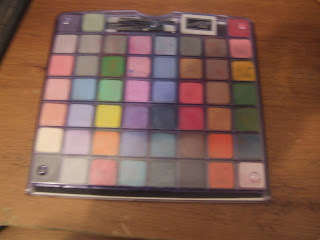 Lots of cool eye shadows for us stampin' up addicts!! I can see us now demo'ing the shades to sell our new In Colors!!! What a sweet dh you have to take such an interest in your kit though.....he's a keeper!! LOL that made me laugh too! When I was younger (like 12) I used to think I was cool wearing pool chalk as eye shadow. Boy what I would have looked like if my mom had been a demo! lol i would have been lmao if he put that on u! !